Mansour Bushnaf is a well-known figure in Libya ,this is his first book in English ,he has been writing since the 1970’s ,his writing end up with him spending ten years in jail during the Gaddafi regime , apart from novels he is also a well-known playwright .Here he is on the bbc talking about the lack of reading and books in Libya due to the recent regime .It is also the first of a new venture in publishing from Darf publishing , a name connected with publishing Arabic literature since the 50’s . Just after Fatima left him . Chewing Gum is actually a very unique book one that I’m pleased to have been sent it has an unusual narrative style as it is told in little vignettes .At the heart is the story of a man Mukhtar , he has seen the love of his life walk away from he was Fatima walk away and we see how their lives twist and turns in the ten years after this as they are from different places ..The other thread of the story is a crazy craze for chewing gum that arrived in Libya in the 80’s as they started to import it from first turkey ,but as the book moves on you see it come from other places as the connections of Libya with the world changes over time .Then there is a statue from the time Italy ran the country that also is symbolic of past events and also the present day .All of this takes place in one part of town ,so what you see is a cross-section of the country in one small place . The gum , in brief , became , everyone’s obsession.But the actual enjoyable act of mastication remained a privilege of the few one of which ,without doubt ,was our heroine . This is one of those books that long after you’ve put it down you think did that represent this .Now it is a story of lost love ,a man pining at one point Mukhtar is compared to the statue having stood or appeared to have stood in the same place looking down the street at the way Fatima left .Now you could see that as the lifetime of Libya and the years stood like a statue being the years under Gaddafi ? 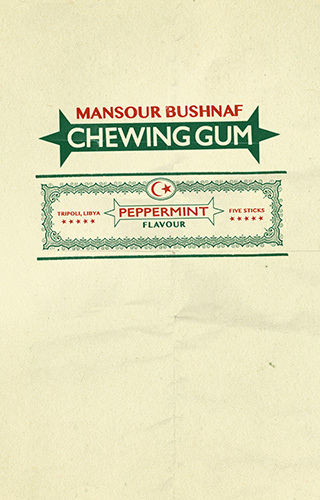 Now the chewing gum is a motif for the outside world and how it connected to Libya over the time ,but also like the Statue, the act of chewing gum is also a way of passing time ,also like Gum it loses its taste maybe Libyans lost the taste of the regime long before they overthrew it or in the gums case throw it a way .What Bushnaf has tried to do is use the gum craze and get people involved academics ,the regime ,shopkeepers and use all these to explain the times .As I said this is a book that you have to read to get it is one that just doesn’t fit easily into a box ,it isn’t like another book from Arabic I’ve read (I am under the belief it is written in English will be translated back to arabic by the writer at a later date ) .Also I do love the simple retro styling of the cover . Like you, I’m drawn to the clean simplicity and retro-styling of the cover design – it would encourage me to pick it up for a closer look. I like your reading of the chewing gum as a motif and metaphor for different themes in the narrative.. I can think of a few writers who should probably do jail time for crimes against literature (haha) but ten years in a Libyan prison is a terrible sentence for WRITING something the regime didn’t like. Just goes to show the power that writing has in some countries where personal expression is so restricted. It would be a brave person to take on that kind of oppression. I think we could all probably do with a bit of insight about what went on in Libya, so I’m putting it on the TBR list. Really intrigued by this one, thanks for sharing. Might have to pick it up for my Around the World reading challenge.